We go through moments in life that make us worried, stressed and very anxious...so anxious that our thought patterns are distorted or we become immobile and don’t want to take action. Some people self-medicate with alcohol or drugs, or even overeat unhealthy food which may lead to other addictive behaviors. Even though these methods may work temporarily, they are only numbing feelings and not relieving the underlying problems. What's needed is a regular, daily health routine for the long term. There are so many facets of anxiety and so much that can help relieve symptoms such as talk therapy, art, working out, good nutrition and, of course, yoga. Often, we feel instilled with fear and reluctance, and find that there is no way out of our stressful situations. 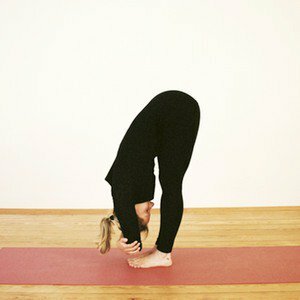 A regular yoga practice incorporating the right poses can help to alleviate some of this anxiety. Yoga involves deep breathing, focusing on postures and stilling the mind. It’s a practice tailor made specifically for you. It's not listening to outside noise or competing with anyone else. The aim of your anxiety alleviating practice is to choose movements that calm you, keep you in the moment and not feeling rushed and are not extremely challenging to you. The following movements are helpful to ease anxiety and are possible for nearly everyone to attempt and practice. Make sure you have a comfortable mat and clothing, enough space, no distraction, peaceful music and essential oil (if you like) and adequate time (at least 30 uninterrupted minutes). Without the right place and set up, your yoga practice will not bring you the comfort you require. Remember to always take full, long deep breaths as you practice. Here are six yoga poses that you can practice daily to slow your racing mind. Try to spend at least 3-5 minutes in each posture to gain the maximum benefit. Yoga alone is not a cure-all for anxiety, but enjoying these movements are an important part of self-care and nurturing for your body and mind. Put your mat against a wall where you can stretch your legs. Place your buttocks as close as possible to the wall. It is easier if you curl to your side first, pressing your hip to the wallm and then turn when you can stretch your legs straight against the wall. Relax your arms by your side with your palms facing up. Close your eyes or use an eye pad (scented is great). Clear your mind by focusing on your breath. Take deep breaths here: 5 counts to inhale, 5 counts to exhale. Allow yourself to release tension here as you hold this pose for as long as you like. Your heart rate typically slows down immediately here. Tips: If it’s hard to keep your back on the floor with your legs raised, use a bolster under hips to help elevate them. You can also put on some relaxing music or nature sounds. Something about elevating the legs above the heart allows tension and stress to melt away. Make sure you have a thick enough mat (or use a blanket) that is supportive for your knees so that you can feel comfortable. You can have your knees together or spread in a V-shape. Reach your arms up and stretch forward as far as you can. Soften, release, let go and close your eyes. Release your head, arms, neck, shoulders, back and, of course, your thoughts. Allow your body to melt into the mat; try not to hold tension in your muscles. Allow yourself to melt deeper with each deep breath. Find peacefulness in this pose. Sit upright on your mat with your legs stretched in front of you. Move your seat from side to side to adjust to make your sitting bones connect to the mat. Reach your arms up with a long spine and stretch your heart forward to your toes. Go as far as is possible for your body where you can feel a stretch but no pain. If you keep a flat back, you will target the stretch in your hamstrings. If your back is rounded, the stretch will target more of your back. Both are effective and useful. Choose whichever suites you better in this moment. You can have your toes pointed or flexed. Try both to see what is the best stretch for you. After a few minutes, slowly roll up. This pose can relieve anxiety, mild depression and helps to relieve headaches. Come onto all fours with your hands below shoulders and your knees below your hip bones, keeping your back straight in a neutral position. Inhale, lower your belly, draw your shoulder blades together and peel open your chest, lifting your gaze to find Cow Pose. Exhale, press against your palms, round into your back body as you draw your shoulder blades apart from each other, gazing toward your navel to find Cat Pose. Continue these movements following your breath. Feel the arching movement up and down throughout your back while inhaling and exhaling with the rhythm of the movement. Move slowly to feel the movement of each vertebra of your spine. This is such a relaxing and releasing combination of postures if done properly. Keep your eyes closed to focus on connecting each movement to your breath. 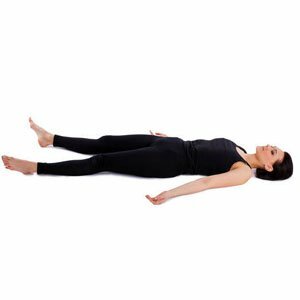 This is a very beneficial pose that can be used at anytime, as no mat is required. Do it at the office, while shopping, before anything that creates anxiety. It gives you energy and releases tension. Stand with your feet either together or hip-distance apart. Keep an elongated spine as you raise your arms overhead and then hinge from your hips as you fold forward reaching down toward your toes. You may just let everything go and hang like a rag doll or hold opposite elbows with opposite hands. Feel the heaviness release from your shoulders, upper back, and head (the places that we tend to keep most of our tension). Close your eyes and take deep breaths, letting go of any thoughts, and hold for as long as you like. This pose is considered to be the easiest to do physically, but the most difficult for the mind and spirit to master. Lie down on your mat with your arms by your side, palms up, legs relaxed, with feet turning toward the sides of your mat. You may use a pillow under your knees to support your lower back if you feel tension there. Close your eyes, release any tension in your face. Practice deep breathing in and out until you feel very relaxed. Tips: The best way to determine if you are relaxed and not holding tension is to tighten or clench your entire body, hold for a moment, and then release. Clear your mind; and if any disruptive thought enters, remind yourself that this is not the time to think about it. You will return to it later. Hopefully, these poses will become second nature to you and you can turn to them when needed. You can practice at home or anywhere else that has physical and emotional space for you to practice yoga. Don’t forget to clear your mind by practicing deep breathing and focusing on each movement. Anxiety is not forever and can be managed on your way back to becoming calm and content.